on Main St., Vancouver, BC. Here at Mali Thai, a small family-owned business, we offer takeout and delivery meals, as well as dine-in dishes in our tiny, yet cozy front of house! All the sauces are made fresh in our clean kitchen by our beloved Thai chef owners. 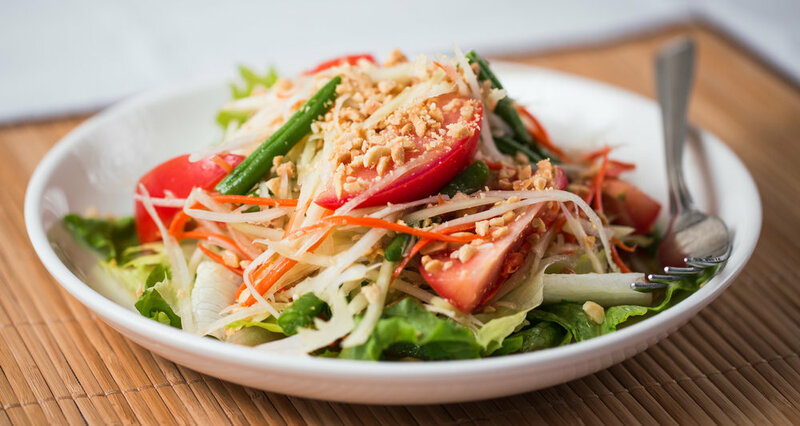 We believe in delivering authentic and flavourful Thai food with affordable prices and without compromising on quality fresh ingredients and portion sizes. Our menu features a diverse range of Thai food for guests to enjoy in everyday life. Also, if you want to order (takeout/delivery) our homemade food for a large party, we can certainly do our best to accommodate you! With that said, we also provide food selections which are gluten free, vegetarian, and vegan (please note that those special items are available on request). In the countless busy and rainy days in Vancouver, we understand that you don’t feel like cooking or going out to get food. So please let us take care of your meals by giving us a call at 604-879-3929, 604-879-0560, or 604-876-4444, OR simply order online HERE. COPYRIGHT © 2018 MALI THAI Restaurant. ALL PHOTOGRAPHS, ILLUSTRATIONS, GRAPHIC DESIGNS, AND BLOG POSTS BELONG TO MALI THAI Restaurant by Naline (UNLESS OTHERWISE INDICATED).